For more than 30 years the Cospas-Sarsat system has been the mainstay of modern search and rescue, with many thousands of people rescued thanks to the orbiting satellites that monitor distress signals broadcast on the 406MHz band from EPIRBs and personal locator beacons. The problem with the Cospas-Sarsat combination of low-earth-orbit (LEO) and geostationary (GEO) satellites is that while the latter’s wide view of the earth can detect a signal almost instantly, it cannot locate it precisely (unless the beacon has its own GPS), and it can take an hour or more for an LEO satellite to get a fix on the beacon’s location and transmit it to a land station so search-and-rescue can be implemented. Even then, position errors of half a mile or more are not unusual. Enter the Medium-altitude Earth Orbit Search and Rescue system, or MEOSAR. 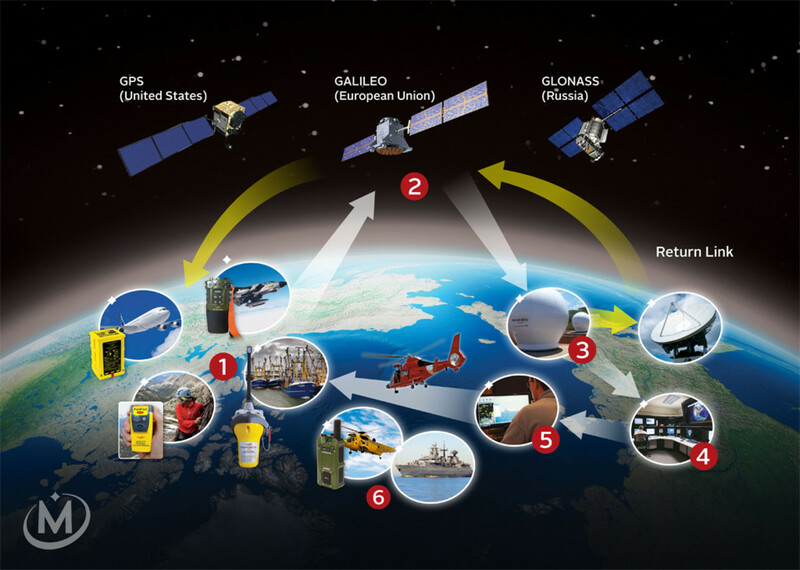 This employs transponders placed on middle-earth-orbit (MEO) navigation satellites—Russia’s GLONASS system, the Galileo satellites from Europe and the U.S.-built GPS constellation. These MEO satellites have as much as seven times the coverage of the LEOs, and there are many more of them, so distress signals can be pinpointed within minutes of a beacon being activated. The system is being phased in gradually, but already it is saving lives. In July, a hiker in New Zealand who broke his leg and activated a PLB was located within four minutes—the same signal was not picked up by Cospas-Sarsat for another 50 minutes. Sean McCrystal of McMurdo, which built the New Zealand MEOSAR ground station system and also makes emergency beacons, says the system can pinpoint a distress signal to within 300ft within 5 minutes of it being activated. All 72 MEO satellites—there are just 12 Cospas-Sarsat LEOs—will be on stream within 5 years.